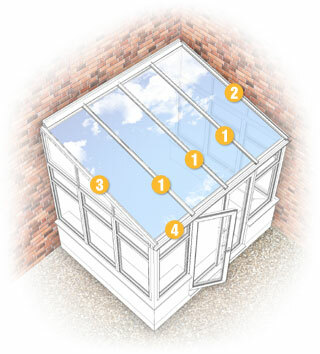 ClearAmber's Snap-Fix rafter bars secure and weather-proof roof glazing to wooden rafters of timber conservatories. Main Bar - aluminium Base Bar with PVC-u Top Capping that sits on intermediate timber rafters to join inline glazing. Wall Bar - features top capping with flashing trim and fitted to timber rafters that abut a wall. Main Bar + Edge Trim - Edge Trim used with standard Main Bar to close exposed end rafter of Lean-To and Gable roofs. End Closure - PVC-u profile fitted to bottom end of roof panels to provide protection and neat finish. Note: Dedicated Snap-Tight Hip Bar may be preferred for hip rafter of hipped roofs, like Victorian or Georgian conservatories.